In this wordless poem, the invasion of a malevolent corporate regime causes a peaceful society to become embroiled in disquiet and savage upheaval. This thought-provoking "wordless poem" of black-and-white images evokes enlightenment, heightened consciousness balanced by fear. 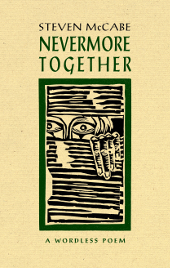 Never More Together, a visual and wordless poem by Steven McCabe, is an unsettling story of the harsh treatment of truth and perspicaciousness in a society ruled by fear. McCabe introduces a world cradled in the coils of a giant serpent who watches over a garden where a man and a woman eat an apple of mystical origin and enjoy an innocent love. The simple familiarity of this story is rudely broken by the realization that a shadowy government is watching them in the garden on a screen. Throughout the poem, the idea of enlightenment and heightened consciousness brought by the apple recurs, and the giant serpent continues to represent those ideas, uniting the people in the story and eventually gaining enough ground on earth to defeat the shadowy government. This story is thought-provoking and easy—sometimes unsettlingly easy—to relate to. 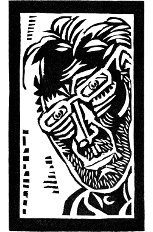 But it is also sometimes difficult to tease it out from among the confused images of the linocut prints. According to the written introduction, the prints were created and the story completed in merely forty days. That is an impressive flurry of activity, and is reflected in the urgency and emotion in the poem. However, it might be because of this speed that, without the help of the summary provided in the introduction, much of the poem is indecipherable. For example, it is frequently difficult to distinguish new and recurring characters. Of course, part of the merit of a wordless story is the many layers and interpretations allowed for between the artist and the reader. Still, a certain amount of visual clarity is expected. The fact that the greater arc of the story is largely unintelligible without the help of a written narrative could undermine the power of the wordless poem. Images can speak a truth directly to the mind that written words dilute, and pictures are a universal language. While aspects of the story require a background in a certain kind of culture—for example, the allusions to Christian origin mythology using transformation after eating the apple, the serpent, and a flying dove preluding peace—and might limit the audience, the poem really loses its universal potential when it requires translation. McCabe’s poem blends the power of mythology and allegory with the more close-to-home imagery of police violence and of the government monitoring—and punishing—the more enlightened citizens. 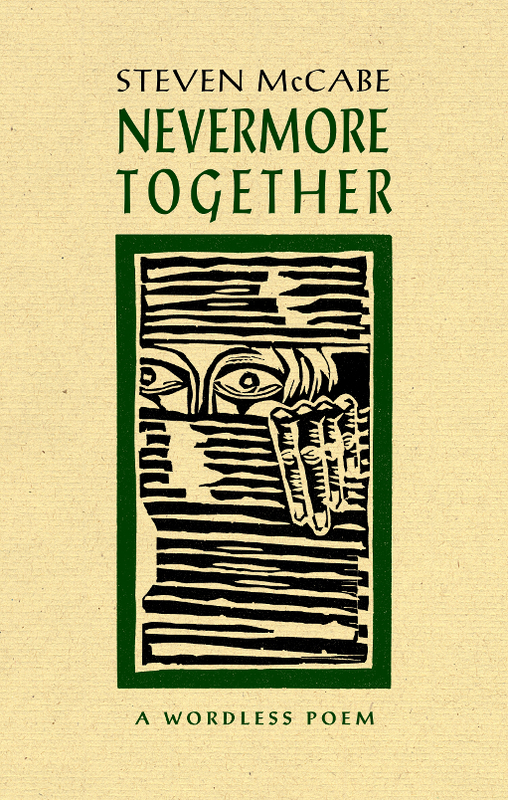 Never More Together has the appeal of a classic fairy tale, where good and evil are clearly delineated, but at its heart, it reveals a much more complex story. ‘Hemingway said the old man is an old man and the sea is the sea. Joseph Campbell said the mother goddess is a universal archetype. Steven McCabe made an image of an apple and it started a war. In a world that is strange yet weirdly familiar, men and women are watched over by a malevolent, authoritarian police state, a monstrous serpent slithers and coils in gardens and above planets, vast forces drive the lives and fates of a society, and of a man, woman and boy who come together and drift apart in an urban hell, while a savage social protest dances on. A city and a society sink into an abyss. McCabe is a silent witness to a dystopian creation that he describes in this wordless allegory blending and redefining allusions to Biblical episodes, symbolic stories, social critiques, and a vision of social interaction as one unholy confrontation that threatens to render asunder the bond that unites a man and a woman, both of whom are helpless victims of fate’s inevitability, and the state’s punitiveness. The author sees what can become of a society that fears truth. A modern, surreal myth, Never More Together comprises series of a dozen episodes set down as both warnings and prophesies. Visual poems every one, the individual prints, carved in linoleum and printed in a near frenzy of activity over the course of a mere forty days, speak in a language all their own. McCabe’s is a personally expressive and unique iconography that mashes readable symbols and densely constructed compositions that mash space and action into taut, formidable and urgent declamatory visual statements. We are creatures of language through which we order and describe our world. Picture narratives are one of the most powerful tools we have for reconstructing our experiences and telling our stories. It may be argued it is also one of the oldest forms of communication. In our time we are saturated with images through the media and the technologies we use to communicate pictures. Billions of images are shared every second through TV, social media, cell phones, web sites and print. Bill boards and signs clutter our urban landscape telling us what to buy, what to see who to vote for. Some would argue that this abundance of images has made us blind, but I would argue that it has increased our visual literacy. We read the image as text. Steve McCabe has created a visual epic poem of a rich and complex form that challenges the reader to look actively and decipher the layered meanings. It is a fitting addition to the Porcupine’s Quill’s series of wordless narratives created using traditional printmaking techniques. It is a form of storytelling that revives the graphic sensibilities of artists like Frans Masereel, Lynd Ward and Laurence Hyde whose social justice wordless narratives still fascinate us today. 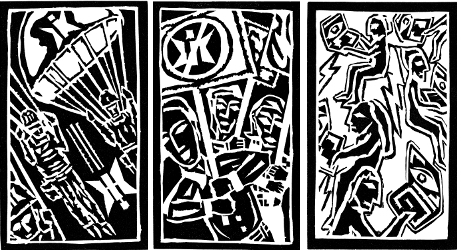 It is with great pleasure that we offer Steve’s masterful linocuts knowing that each reader will bring their own visual vocabulary to the story. Read each picture slowly giving each image the time it deserves and you will be richer for the experience.